Klayman: "Stupid Is a Stupid Does!" Foles Is a Winner and Wentz Injury Prone! Always Go With a Winner! 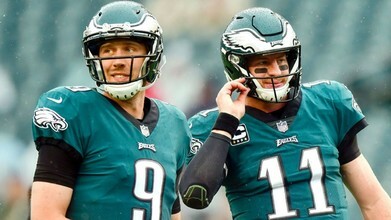 PHILADELPHIA -- The Eagles are sticking with Carson Wentz as their quarterback despite the late-season success of Nick Foles over the past two years. "Yes, Carson Wentz is the quarterback going forward," coach Doug Pederson said at a joint news conference with executive vice president of football operations Howie Roseman on Tuesday. "And in Nick's case, listen, we'd love to have everybody back throughout the roster, but as I've said many, many times, it's not about one guy, it's about the team, and we're going to do what's best for the team."